The living "pearly nautilus," also called the "chambered nautilus," is a favorite seashell of many collectors. Today, the biodiversity (number of species) of these animals is very low, and they are confined to tropical waters in the equatorial region of the western Pacific. As certain times in the geologic past, however, when warm oceans extended north and south of where they are now, chambered shells similar to the "pearly nautilus" had high biodiversity, and their distribution was widespread (cosmopolitan). These chambered shells are commonly referred to as coiled nautiloids. On August, 2016, I created a post about the "pearly nautilus," and two of my pictures are shown again here for comparative purposes. I encourage you to use the "search box" at the top right-hand side of this blog page to find this post and read it again. I also give some interesting details about the life habits of this animal. Exterior of a modern-day "pearly nautilus." This present post concerns one of these ancient widespread groups of coiled nautiloids, namely, an extinct genus belonging to genus Aturia Bronn, 1838. It was widespread (cosmopolitan) and its geologic time range was Paleocene to Miocene (approximately 40 million years long). 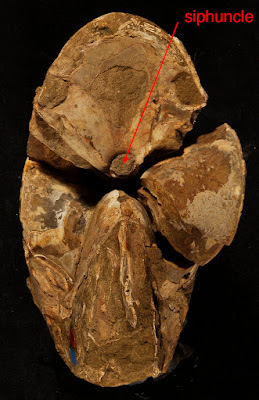 In particular, this post is about Aturia myrlae Hanna, 1927, an early to middle Eocene species of genus Aturia. The ancient geographic distribution of this species covered an area now referred to as central California, southern California (including Ventura, Los Angeles, and San Diego counties), and Baja California Sur, Mexico. Aturia lived in subtropical to tropical ancient environments. So, if you are lucky enough to find one of these fossils, you can be certain that it represents a warm-water ancient environment. Specimens are not that common because, like other coiled nautiloids, Aturia was a predator, thus, their numbers were few. The next three pictures show a partial specimen of Aturia myrlae from Simi Valley, southern California. 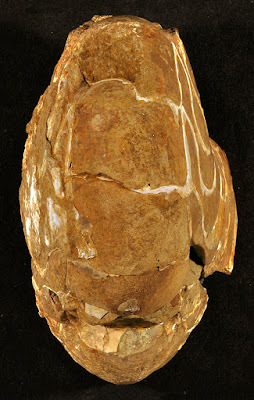 The widest dimension (diameter) of this incomplete specimen is 14 cm. 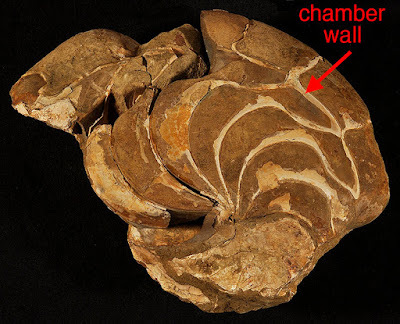 Side view showing the complex outlines (septal pattern or suture pattern) of the chamber walls (septa). 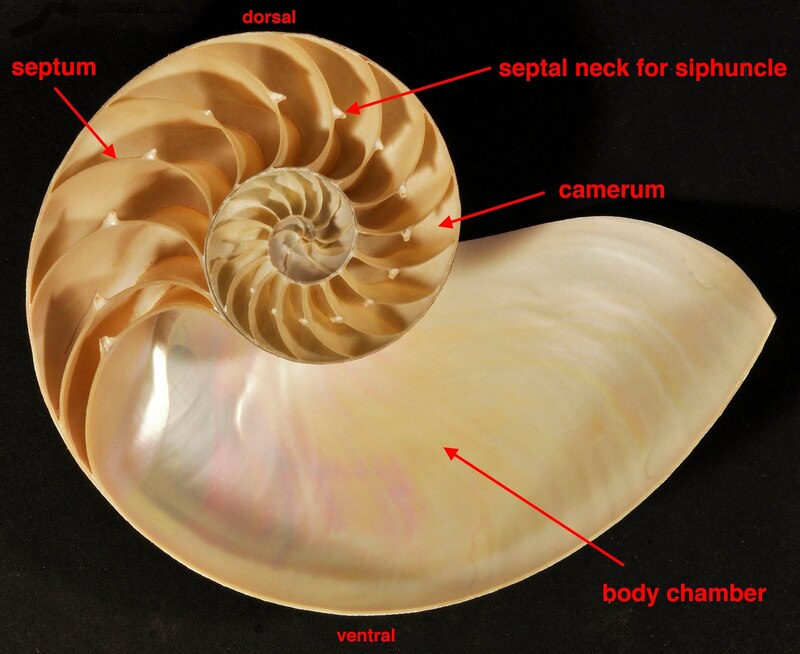 The suture pattern of Aturia is a very distinctive character of this genus and is in sharp contrast to the simple-curved suture pattern of the "pearly nautilus," which belongs to genus Nautilus. Back side view of the same specimen. Front view of the same specimen. Notice the presence of the siphuncle (see a reference picture at the beginning of this post), which was a hollow tube that connected all the empty chambers and allowed for nitrogen gas to be dispersed to all the chambers. In so doing, the shell achieved buoyancy when the gas was pumped in, and the shell sank when the gas was pumped out. The shell could, therefore, move up and down in the water column.